Musical Ecologies continues Thursday February 12th with Brooklyn-based composer and musician Laura Ortman. Playing violin, keyboards, guitars and other instruments, Ortman will be joined by electronic artists Michael Garofalo and Pat Noecker for an evening of electroacoustic atmospheres and ambiance. Incorporating diverse influences ranging from folk music, post-rock, ambient, free improvisation and electronica, the artists will be performing as a trio together for the first time. 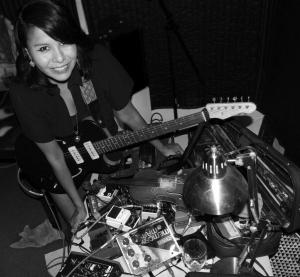 Laura Ortman (White Mountain Apache) is a Brooklyn composer, musician, visual artist, and hairstylist. Currently, she is recording her third solo album with Gowanus engineer Martin Bisi, playing violin, Apache violin, electric guitar, amplified piano, Casio, pedal steel guitar, vocals, samples and field recordings. She has collaborated with great artists, filmmakers, musicians and dancers from New York, New Mexico, Italy and Canada, including Jock Soto, Nanobah Becker, Raven Chacon, Martha Colburn, Tony Conrad, Pauline Oliveros, Okkyung Lee, Alan Michelson, Lorenzo Clayton, and Pegi Vail. She has performed and recorded with New York bands Stars Like Fleas, The Dust Dive, Black Mirror Picnic, Raft's Assemble, and White Hills. In the fall of 2014 she was awarded a five week Rauschenberg Residency for music in Captiva, Florida. In 2008, she founded the Coast Orchestra, an all-Native American orchestral ensemble performing and improvising to the 1914 original score to photographer Edward Curtis's only film "In the Land of the Head Hunters" to sold-out audiences at the National Gallery of Art in Washington, D.C., and the American Museum of Natural History in New York. Michael Garofalo is an electro-acoustic musician and documentary radio producer. Using analog synthesizers, lamellophones, field recordings, and found sounds he crafts pieces that reside in a sonic territory between incidental music for radio and television and eccentric synthpop. He was a founding member of the improvising trio Latitude/Longitude (active 2004-2010). Today, he performs solo and with like-minded artists. Recent collaborations include the experimental radio piece, "In Determining John Cage" (2012), with Shonni Enelow and Josh Hoglund, and an outdoor installation-performance at Groundswell 2014, "Black Mirror Picnic," with Laura Ortman and Bryan Zimmerman. Michael's documentary radio work can be heard nationally on public radio as part of the long-running StoryCorps series. Hailing from Brooklyn, Raft is Pat Noecker’s one-man exploration of the potential technological intimacies between the artist and his audience. Using a cell phone, loop pedals, and musical apps, RAFT is the culmination of crowd-sourced material in the form of text messages, photos, and videos that are sent to Noecker throughout the duration of the show, thus creating a collective sonic and visual diary of the audience as processed through Noecker. RAFT has only recently emerged as Noecker’s primary voice, initially drifting for many years alongside Noecker’s prolific involvement in musical projects such as Liars, These Are Powers, and the Bubu Gang. His groups have performed in numerous cultural venues including MoMA, the Whitney, PS1 the Kennedy Center, the Getty Museum, London ICA, and the San Francisco Fillmore, and has received critical acclaim from numerous publications such as Rolling Stone, The New Yorker, New York Magazine, Spin, Time-Out, the New York Times, and more. Noecker is also the creator of ASSEMBLE, a series of improvisational collaborative round robins that has featured artists such as Bob Boilen (NPR s All Songs Considered), Jerry Busher (Fugazi), and Taraka Larson (Prince Rama). Comments closed — Trackbacks closed RSS 2.0 feed for these comments This entry (permalink) was posted on Thursday, January 15, 2015, at 11:25 am by Dan Joseph. Filed in press release.